ADAMS, Aliston Whitman (Johnny) - 98, born in Wood’s Harbour, NS, May 3, 1917, passed away at Yarmouth Regional Hospital on March 18, 2016 with his daughter Esther by his side. Johnny was the son of the late Milton and Lulu Nickerson Adams and was predeceased by his wife Francis Cooper Adams; and brothers, Owen and Harris; sisters, Ora, Eliza, Eva and Rilla. He is survived by daughters, Susan (David) Langille, Centreville; and Esther (Leigh) Newell, Newellton; grandsons, Jon (Rhea) Langille, Stoney Island; Christopher (Tammy) Langille, Simcoe, ON; Thomas Newell, Halifax; and Matthew Newell (Sadie), Halifax; and great grandchildren, Monty, Mackenzie, and Sam; and many nieces and nephews. 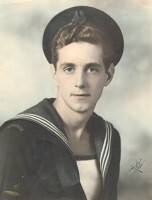 Johnny was a Veteran of World War II, serving in the Royal Canadian Navy aboard corvettes from 1939-1945. Following the war he was a fishermen until his retirement. He was a member of the Royal Canadian Legion – Cape Sable Island Branch 148. Since 2012 Johnny has been a resident of Veteran’s Place, Yarmouth, NS. Special thanks go to the Nursing staff at Veteran’s Place and to volunteers Mel, Rita and Ann Marie; and to Sharon and Marsha for their kindness. Visitation will be held on Tuesday, March 22, 2016 from 7-9 pm at Huskilson’s Memorial Chapel, Barrington, NS. Funeral service will be held at 2 pm on Wednesday, March 23, 2016, at H. M. Huskilson’s Memorial Chapel, Barrington, NS with Pastor Don Scheel officiating. Family flowers only. Donations may be made to the Yarmouth Regional Hospital Foundation, Canadian Cancer Society, Canadian Diabetes Association, or charity of choice. 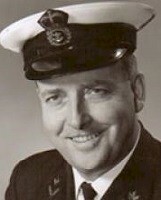 Jack Alexander was the Executive Officer on HMCS Ojibwa 1969/70 and was a member of HMCS Onondaga's Commissioning crew. Jack began his service earlier in the 1960s in the Royal Navy Boats. He was also the CO of HMCS Cormorant in 1981-83. BOWSER, Percy Lloyd (17 Nov 1920 - 29 Mar 2016) - 95 of Halifax passed away peacefully March 29, 2016 at the Camphill Veteran Hospital. Born in Ostrea Lake Nova Scotia, he was the son of the late Calvin and Minnie Bowser. Percy served in the Navy for four and a half years during WWII. He worked 24 years for the Provincial Government, and was the founder of NWBC Broadcasting, channel 10, where he was known as his handle "Hound Dawg". Past Master of the Masonic Order of Royal Sussex and member of the Northern Lights Club, he will be missed by many. Percy is survived by his wife Laura (Murray) of 69 years. Predeceased by his sister, Murial and brother, William. Cremation has taken place. Service to be held Saturday, April 2, 2016 at St. Margaret of Scotland Anglican Church. In lieu of flowers donations may be made to the St. Margaret of Scotland Building Fund. Special Thanks to Dr. Frank Doane, Dr. David Bell, Dr. A. Samod, and Dr. Alison Wiebe, nurses on V5West, Samantha, Michelle and Corey, to Florence in the dining room, Leona Arsenault, cousin, Gladys Carter, Brenda and Barry Baker and Cannon Charles Bull. CLARK, David Wesley - 81, of East Ferry, passed away peacefully at home surrounded by his family on Saturday, February 16, 2013. Born in Ingersoll, Ontario; he was a son of the late Ralph Clark and the late Ena (nee Boswell) and Joseph Fitzgerald. Dave joined the Navy in August of 1950. He served on the following HMC Ships; La Hulloise, Magnificent (Twice), Chignecto, Buckingham, Assiniboine, and Margaree. He also served in these Shore Establishments; Cornwall (Four Times), Naden, Stadacona (Five Times) Carleton, RCN Liasison Office in Bermuda, and C.F.B. Greenwood. He retired from the Canadian Military in November 1986 at the rank of Chief Warrant Officer. Dave was then appointed Harbour Master for fourteen fishing harbours on Digby Neck and Islands until he finally retired in 1997. Dave will be sadly missed by his wife of 57 years, Marion (McClafferty), East Ferry; sons David (Beverley), Dartmouth; Darby (Anuschka Jam), Cornwall, PEI; Desmond (Crystal), Sandy Cove; brother William "Barrie" (Susan), London, Ontario; sister Shirley Oakley, Mississauga, Ontario; eight grandchildren; and seven great grandchildren. Besides his parents Dave was predeceased by his brother in law Alex Slater. At the family's request cremation has taken place and a graveside service will take place in the East Ferry Cemetery at a later date. Donations in Dave's memory may be made to the Canadian Cancer Society. Arrangements are under the care and direction of Serenity Lindsay Funeral Home and Crematorium, 192 Commercial Street, Berwick, Nova Scotia B0P 1E0. DAIKENS, George Morris (Bud) - passed away peacefully at the Port Colborne General Hospital on Friday May 22, 2009 at the age of 86 years. Beloved husband of Lydia, (Rose) his wife of 65 years. Father of 4 sons David (Merry), Randy (Eileen), Rusty (Sylvia) and Steven (Bonnie) and many grandchildren and great grandchildren. Bud was born on May 1, 1923 in Windsor, Ontario. He served in the Battle of the Atlantic during World War II, was an Auxiliary Ontario Police Officer, a Deputy Game Warden and proudly served as a volunteer for many other organizations. He was employed for 25 years at the Ford Motor Company before retirement. “Bud” will be missed by all. (Rose-Bud) There will be no visitation and cremation will take place. A small family gathering will take place at a later date. If so desired, memorial donations may be made to the Alzheimer Society. Funeral arrangements entrusted to the Port Colborne Chapel of the Davidson Funeral Homes 135 Clarence St.
DENBY, Dallas (Raymond) (19 Nov 1943 - 10 Mar 2015) - The family regrets to announce the passing of Dallas Denby at the age of 71 years. Dallas was born and raised in Winnipegosis, MB, in a family of fisherman. Early in his life Dallas joined the Canadian navy on a submarine crew and travelled to the UK. His life passion was looking through the windshield of his semi-truck as he travelled across North America. He loved to be on the road and spent over 50 years of his life behind the big wheel. Dallas built his own trucking company and afterward had a successful long-term contract hauling steel across Canada. He met many fellow drivers and lifelong friends along the way. He loved to share stories and to have others join in his laughter. The love of Dallas’ life was his wife Joan (Joanny) who passed away in 2004 and he never recovered from her loss. He leaves his daughters, Cara (Paul) Mazurik, Tammi Denby (Grant McKercher); sons Travis (Larissa) Denby, James (Lisa) Denby and his ten grandchildren, Brendan, Cole, Payton, Austin, Ella, Julia, Phoebe, Reign, Oakley and Ava. He is also survived by his brother, Harold (Patricia). He was predeceased by his brothers, Tiny (Mary) and Howard and sisters, Phoebe (Charlie) Hunt, Shirley (Harry) Jackson, and Gail (Dale). Dallas had a heart of gold and would give the shirt off of his back to anyone. He was a sensitive and generous soul and will be deeply missed by his family and friends. At Dallas’ request there will be no formal service but please have a coffee at Sun Valley Restaurant in his honour, share a story and spread some laughter. A special thank you to Mike MacCoy and his loving family for going above and beyond to help us care for Dallas. Let us all hope we can have a friend like Mike to watch over us. Heartfelt thanks to the wonderful nurses and doctors at St. Boniface Palliative Care Unit, and to Dr. Hashmi and his family and staff for their care and attention. In lieu of flowers, follow Dallas’ example and be kind to others, offer endless loyalty and generosity to friends, and show your family all-encompassing love. DOIRON, Dana Phillip (1945-2016) - Age 70, passed away suddenly at home on March 8, 2016, from complications of diabetes and the flu. Dana was born in Ottawa, grew up in Montreal and spent most of his adult life in Nova Scotia. He is survived by his children: Aran, Sara, Samuel, Alexandra and Genevieve; and his sister Bonnie. Dana enjoyed a long and successful career as a public relations and advertising consultant, entrepreneur and most recently as the director of policy and communications for Elections Nova Scotia. A graduate of Loyola College and Sir George Williams (now Concordia) University, he spent his formative years with University Naval Training Division of the Royal Canadian Navy, where achieved the rank of lieutenant. He appreciated fine wines, good food and clever writing wherever it was found: be it literature, poetry, political cartoons or an exceptional ad campaign. A voracious reader, he also loved both the outdoors and playing cards. Rainy conditions for the former made the latter all the more important. He will be remembered as a devoted father, loyal friend and brilliant strategist. Sadly missed by his children, Nancy Watson and his many friends. A memorial celebration of his life will be held sometime this summer on his beloved South Shore. GUERIN, Michael Francis, Ck, RCNVR - Born: 31 Jan 1924, Peterborough, Ont. Died: 26 Jan 2002, Peterborough, Ont. LEVENTHAL, Abraham Joseph (Abe) - it is with deep sadness that we announce the death of Abraham Joseph Leventhal, age 90, who passed away peacefully at home, in Halifax, on Monday, March 21, 2016. Born in Halifax, on May 12, 1925, he was the son of the late Ethel (Phillipson) and Frank Leventhal. He grew up on Brunswick Street, and he attended Bloomfield High School. He received his Bachelor of Commerce degree from Dalhousie University, in 1944. During the Second World War, he served as a medic in the Royal Canadian Navy Medical Corps. At Dalhousie, he was an active member of the fraternity, Tau Epsilon Phi. Abe was a lifelong member of Beth Israel Synagogue. He served on a variety of committees and was especially committed to the preservation of the Baron de Hirsch Cemetery. At an early age, Abe felt a connection to a community that was close and where concern for others was a top priority. In his mid-20s, he held the position of President in Halifax Scouts, which stemmed from his early days, as an Eagle Scout. He became the first Jewish Cub Master, at age 30. A prominent and generous businessman, Abe worked with Dominion Metal (owned by his now deceased brother-in-law, Joseph Jacobson) in the mid-40’s and began to dabble in real estate, in the city. He met his beloved wife, Elaine Devara (Zive), in 1946, and they married on February 19, 1952. They were married for almost 50 years, until Elaine’s passing on April 13, 2001. In later life, he met his longtime companion, Sigrun Zibara, with whom he shared many good times and adventures. Keeping an eye on real estate, Abe purchased several rental properties throughout Halifax, and along with his wife, Elaine, they were favorite landlords to many Halifax tenants. Later, he bought The Sterling Hotel on Barrington Street, with his brother-in-law Joseph. With an avid interest in art and antiques, Abe and Elaine were responsible for its restoration, and it soon became known as Halifax’s Waverley Inn. Their keen and distinguished taste and ingenuity was instrumental in purchasing many of the beautiful antiques and dcor in the family-owned Waverley Inn, where they spent a great deal of time. The Waverley Inn became a landmark, during the holiday season, and it was known for its remarkable light display and decorations, every year. Abe would visit the inn regularly, up until a few months before his passing. His nieces and nephew will always remember weekly Sunday dinners, with Uncle Abe, his strong opinions, on all topics, rendezvousing for the World Skating Championships, his visits to California, his love of antiques, walking and sitting along the Halifax Waterfront enjoying ice cream, his joy in decorating the Waverley Inn and his home, and his overall genuine love. A silent philanthropist, seeking neither attention, nor accolades, Abe Leventhal preferred to give quietly, from his heart. He was a loyal supporter to the arts, to education, to the Jewish community, and to medical research, at various hospitals and universities, locally. Abe will always be remembered for his compassionate generosity, his love of people, and his kindness to the staff, at the Halifax Waverley Inn, and to all who knew him. Besides his wife, his sister, Jeannette Jacobson, and his brother-in-law, Joseph, predeceased him. He is survived by his nieces, Arlene Glube (Ken), Upland, Calif.; Shelley Berezin (Gary), Ottawa; nephew, Fred Jacobson (Bev), Altadena, Calif.; great niece, Robin Storfer, and great nephew, Jamie Berezin. He also immensely enjoyed the company of his little dog, Taz. The family would like to thank Dr. Jalal Hosein, Dr. Victoria Mitchell, and Dr. Ken Rockwood, along with the private nursing staff and all his other caretakers, who enabled him to remain, in his home, until his final days. In addition, the family extends its deepest and heartfelt gratitude to the Waverley Inn Staff, with special mention to Calvin Blades. Interment will take place today, Thursday, March 24, at 2:30 p.m. in Baron de Hirsch Cemetery, Connaught Avenue and Windsor Street. In lieu of flowers, please make a donation to a charity of your choice. Abe Leventhal will be dearly missed. 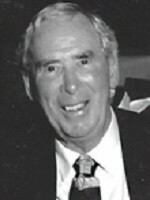 MILLER, Ronald (Dusty) - 70, of East Dalhousie, passed away Saturday, April 7, 2012. Born in Scotchtown, Cape Breton, NS, he was the eldest son of the late Daniel and Margaret (McLellan) Miller. Dusty was a kind and generous man who proudly served in the Royal Canadian Navy for 25 years before retiring to cottage country. He leaves behind daughters Michelle (Craig) and Kathryn (Jamie), and his beloved granddaughters Emily and Natalie. He was predeceased by his older sister, Ann McGuire (George), Brampton. He is survived by his brothers Daniel, Ottawa; Eldon, New Waterford; and Charlie, Halifax. Special thanks to the South Shore Palliative Care team, the VON nurses, and the wonderful ladies from Care Choices. You all made it possible for Ron to stay at home for as long as possible during his final days. In keeping with Ron's wishes, there will be no flowers or visitation. A private graveside service will be held in Cape Breton at a later date. Donations in Ron's memory may be made to the Canadian Cancer Society or a charity of choice. MUIR, Michael Joseph (Mike), Sgt - age 60, of Ellershouse, Hants County, passed away on Sunday, February 21, 2010, at his home. Born on April 23, 1949, in Toronto, Ontario, he was a son of the late Alexander and Mina (Gorman) Muir. Michael joined the Canadian Armed Forces in 1968 and served on bases in Ontario and Nova Scotia, rising to the rank of Sergeant, before his retirement. After his military service, he joined the Canadian Corps of Commissionaires, serving in Nova Scotia until recently. He is survived by his children, Tim Muir (Elaine Aalder), Three Mile Plains; Heather (Jimmy) Macumber, Three Mile Plains; and Michelle Muir (Gary Underwood), Ardoise; grandchildren, Tyler Muir, Branden Muir, Evan Macumber, Lukas Underwood; his former wife, Sandra Swinamer; sister, Sandra Muir Reilly; his brother, Gerard Muir; several nieces and nephews. Besides his parents, Alexander and Mina (Gorman) Muir; he was predeceased by his sister, Leona Muir Ryan. Funeral arrangements are under the care of Lindsay's Windsor Funeral Home, 194 King Street, Windsor. Funeral Mass was 10 a.m. Saturday, February 27, 2010, in St. John the Evangelist Roman Catholic Church, 339 King Street, Windsor. The Rev. Fr. Michael J. Walsh officiated, followed by a reception in the Lindsay Family Reception Centre, 184 King Street. Interment was in the Ste. Croix Cemetery, St. Croix. In lieu of flowers, donations in memory were requested to be made to the Canadian Diabetes Association. MYETTE, Vincent L., AB, Radar Operator, A5095 - Passed away peacefully at Fairview Lodge (Whitby) on Friday, March 25th, 2016 in his 99th year. Lovingly remembered by Elsie Myette and their sons Leonard Myette (Brenda), Lonnie Myette and the late Lawrence Myette (Debi). He will be sadly missed by his 6 grandchildren, Christine, Jeffrey, Nicole (Jason), Robert (Monica), Kaitlin, Alex (Natalia) and his great grandson Ryker. Survived by his sister Rita. Predeceased by his father Mark Jeffrey, his mother Mary Jane, his brothers Howard, Ernest, Bernard, Andrew, Alec, Jerry and Raymond, his sisters Mary, Margaret, Mabel and Sarah and his companion Hazel.  Vincent was a WWII veteran with the Royal Canadian Navy and served from October 1, 1941 to September 12, 1945. He was a Radar Operator 1st class on the HMCS Athabaskan Tribal Class Destroyer and experienced considerable action during the short life of the destroyer. The Athabaskan was torpedoed and sank off the coast France on April 29, 1944. He was captured and interned in a German POW camp for the remainder of WWII. Family and friends will be received at W.C. Town Funeral Chapel at 110 Dundas Street East, Whitby on Wednesday, March 30th from 2- 4pm & 7- 9pm and Thursday, March 31st from 12- 1pm. Funeral service will be held at W.C. Town Funeral Chapel on Thursday, March 31st at 1pm followed by a gathering at the Royal Canadian Legion (Branch #112) at 117 Byron Street South, Whitby. The family wishes to extend their appreciation to the caring and compassionate staff of Fairview Lodge for the care given to “Vinnie” during his time at Fairview with a special thank you to Annissa. HMCS ATHABASKAN - Served on Athabaskan as an AB, Radar Operator 1c. Survived the sinking of Athabaskan. Captured by the Germans - became a POW. MacDONALD, John Oswin - 72, of Greenhill Drive Antigonish, formerly of Port Hood, passed away Friday May 22, 2009 in St. Martha's regional Hospital. Born in Judique South he was a son of the late Jim Francis and Mamie (MacDonald) MacDonald. John O. served for 25 years in the Royal Canadian Navy as a CPO, and later worked as a correctional officer in Antigonish. Surviving are his soulmate and best friend Irene Letcher, children Scott (Diane), Paul (Debi), Kelly, Heather (Steve), all of Halifax Celeste (Doug), Ontario, 15 grandchildren, 2 great-grandchildren, brothers Collie and Angus L. (Jean) MacDonald, sisters Mary V. Gillies and Phyllis (Butch) MacDonald all of Port Hood. He was predeceased by brothers Stanley, and Allan, sisters Florence McKenna, Laura MacLean and Helen Robertson. Visitation 2-4 and 7-9 pm Tuesday May 26 in The Port Hood Community Funeral Home. Funeral Mass 11:00 am Wednesday in St. Peters Church, Port Hood, Rev Victor Ozoufuanya presiding. Burial in the parish cemetery. POWER, Mike, LSFC - Word was received that our old winger and shipmate LSFC Mike Power died of a heart attack in Comox on Saturday, 27 Mar 2016. He had just turned 67. Mike sailed on both Chaudiere and St Croix. Mike was a licensed private pilot from his Air Cadet days. After leaving the Navy, Mike flew commercially and ended up as the Chief Flying Instructor at Selkirk College in Castlegar. It would not be an understatement to say that Mike taught a generation of young pilots to fly. His grads are Captains with major airlines throughout the world. He personally logged more than 10,000 hours of flying time. In addition Mike held a reserve commission in the RCAF for more than 20 years. REEVES, Donald Marcus - 80, passed away at South shore Regional Hospital Sat. November 24, 2012. Born in Somerset, Kings Co. May 30, 1932, he was the son of the late Marcus Reeves and Charity Wheeler (Eisnor). He was predeceased by wife, Margaret (Hassett), brother, Lorimer Reeves and great grandchild Willow MacLean Cormier. Survived by daughters, Sandra Proctor (Bernie), Wendy MacLean (Malcolm), Carol (Pat) and Bonnie; sons, Terry and Matthew; grandchildren Jennifer and Mitchell Proctor, Erin and Courtney MacLean; great grandchildren Cashton MacLean Stark and Sparrow MacLean Cormier; several nieces and nephews and special aunt, Polly Fletcher. Donald joined the Royal Canadian Navy in 1949 and served for 25 years, retiring in 1974. He attended the Agricultural College in Truro, graduating in meat cutting, working as manager of the meat department at Co-Op in Caledonia, Shamrock and Save Easy in Bridgewater. Upon his retirement from the Armed Forces Donald and family resided for 30 years in Parkdale, Lun. Co. where he perfected the art of Christmas trees, as well as fruit production, vegetables of every possible variety, pickling, smoked meats and maple syrup. Whatever he put his hand to was met with great success. He was unrivalled in ability as a trout fisherman and hunter. A celebration of his life will be held at Sweeny's Funeral Chapel on November 29, 2-4pm, followed by a gathering of family and friends at 100 MacCulloch Rd., Cookville. Charitable donations can be made to his favorite charity, IWK Hospital for Sick Children. A private family burial will be held at a later date. 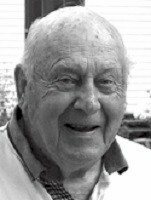 REID, John McCammon - 91, passed away peacefully at Ryan Hall, Bridgewater on Thursday, November 14, 2013 in the presence of loving family. The son of Anne (McCammon) and Charles Reid, he was born and educated in Kingston Ontario. He enjoyed a 31 year career in the Communications Branch of the Royal Canadian Navy, with wartime service in the North Atlantic in HMCS Annapolis, Trillium and Waskesiu. Post war, he served at sea in HMCS Warrior, Haida, Huron, Algonquin and Outremont and ashore in Newfoundland, Quebec, Ontario, and Nova Scotia. A highlight of his career, he served with the Canadian Military Rep Staff at NATO HQ, Brussels Belgium. He retired from the Canadian Forces in 1971 as the Commanding Officer of CFS Mill Cove, Nova Scotia. Following retirement from the military at age 49, John continued with a successful civilian career in Bridgewater, NS with Central Trust, Brady's Lumber and Woodworking, and with Royal Trust Realty. John was a founding member of the South Shore Seniors Golf Association and enjoyed membership in the Bridgewater Golf and Country Club and the Curling Club. He served 3 years on the Municipal School Board and 9 years with the Bridgewater Development Commission. He was a life member of the Conquerall Bank Fire Department where he served 13 years as the treasurer. He was also a member of Admiral Desmond Piers Naval Association, NS Naval Officers Association, Royal Canadian Legion, branch 24, Canadian Naval Memorial Trust (HMCS Sackville) and the FSNA. John was predeceased by the "love of his life", Hazel "Connie" (nee Conrad) with whom he enjoyed 69 years as a living example of what a loving marriage and partnership should be. John will be sadly missed by children, Linda (Gary) Thompson, John (Sue) Reid, Bob (Janice) Reid, Carol (Mike) Anthony, Barry (Debby) Reid; daughter-in-law Melva Reid; brother, Robert (Eleaner) Reid and sisters-in-law Marion Campbell, and Helga Conrad. He leaves incredibly saddened 13 grandchildren, 17 great grandchildren and extended family in Florida, Ontario and Nova Scotia. In addition to wife, Connie, he was predeceased by, sister Margaret and her husband Len Bertrim, sister-in-law Margaret Smith, brother-in-law Dave Smith, brother-in-law Walt "Sonny" Conrad, and daughter-in-law Marie Reid. Interment has taken place with family in attendance. Memorial Celebration will be held at Holy Trinity Anglican Church, 78 Alexandra Ave, Bridgewater at 2 pm on Sunday, November 17,2013 with Rev. Alvin Westgate officiating. In lieu of flowers, donations may be made to the Canadian Naval Memorial Trust, Holy Trinity Anglican Church, The Saint John Sea Dogs Foundation or any charity. RINGER, Eugene (Ted) - of Bridgewater, passed away peacefully after a long battle with pulmonary fibrosis on Thursday, March 09, 2006 in the South Shore Regional Hospital, Bridgewater. Born in Lockport, January 31, 1927, son of the late Randolph and Mary (Benham) Ringer. He served 2 years in the Reserve Army prior to serving 20 years in the Royal Canadian Navy rising to the rank of Chief Petty Officer First Class. After the Navy, he was employed with Palmers Refrigeration and then with Bayers Road Shopping Center as Maintenance Supervisor until his retirement. He was a volunteer with Seniors Wheels and Meals On Wheels. He was an active member in his faith communities of St. Paul's United Church, Spryfield, Osborne Baptist Church, Allendale and his family church of Little Harbour United. He was a member of St. Paul's Lutheran Church, Bridgewater. He was a member of the Royal Canadian Legion Branch 24, Bridgewater. He was an avid baseball fan and he loved to hunt and fish. He is survived by his loving wife, Morlean (Spindler). Ted and Morlean would have celebrated their 57th anniversary on March 26, 2006. Daughters, Peggy (Rod) MacMillan, Courtenay, BC; Patricia (Bruce) Lloy, Stony Plain, AB; Mona (Danny) Cox, Fletchers Lake, NS; grandchildren, Andrew and Matthew (Jenn) MacMillan; Carolyn, David and Kevin Lloy; Allison (fiancé Adam) and Tabitha Cox; sisters, Irma Buchanan, Dorothy (Merton) Swansburg; Jennie Winfield; Beulah (Vernard) Goulden; Hazel (Keith) Williams. He was predeceased by brothers, Clarence and Douglas; sister, Margaret Steer. Visitation will be held Sunday from 2 to 4pm in Sweeny's Funeral Home, Bridgewater. A memorial service will be held 11am Monday in St. Paul's Lutheran Church, Bridgewater, Rev. Paul Jensen officiating. A reception will follow the service in the church hall. Burial will be in Shepherds Hill Cemetery, Riverport at 3pm. Family flowers only. In lieu of flowers, memorial donations may be made to the charity of your choice. ROMBOUGH, Wallace Ormand (Happy) - born in Winnipeg, MB, September 15, 1926 and ended his incredible journey on November 23, 2006 in Victoria, BC. Predeceased by his son Robert; sister Beryl and her husband Walter; brother Ken; sister June; and brother in-law Lloyd. Survived by his loving wife of 59 years, Marjorie and children, John (Deana), Cathy (Gary), Beth (Carlos), Bill (Anne); daughter-in-law Sheryl; ten grandchildren; one great-grandchild; and sisters, Tannys, Marilyn (Earl), Muriel (Don); sister in-law Edith; and brother in-law Peter. In January 1944, Wally enlisted in the RCNVR where he served in the Second World War in England with the fleet air arm. After the war, Wally returned to his family and the C.P.R. in Winnipeg to continue his career as a Machinist. In August 1947, Wally and Marj wed and soon after the family grew with the birth of their first son John in 1953. In 1954, he rejoined the Navy and was stationed to the West Coast where the three settled into their home in Victoria, BC. This journey took the young family to the East Coast and finally back to the West, all the while the family grew with the birth of four more children. Wally served on many different ships, the Big O , Stadacona and the New Glasgow just to name a few. He achieved rank of PO1, ERA and ending his Navel career as an instructor for the Fleet School, CFB Esquimalt. After seeing many world sites, the well-travelled sailor decided it was time to retire from the Navy. He continued to be busy and joined the SunLife Assurance Company until he finally retired in 1987. Wally contributed to his community by being one of the founding members and served as the chairman of the Juan de Fuca Recreation Commission. The Commission was responsible for laying the foundation for the Juan de Fuca Recreation Center through the procurement of land. Wally was a devoted husband, proud father and was elated to have grandchildren as well as a great grandchild. He was known as Happy to his close friends because of his happy-go-lucky nature and his great kibitzing. SEABOYER, Gerald M. - 84, LaHave, Lunenburg County, passed away April 3, 2006 in the South Shore Regional Hospital, Bridgewater. Born in LaHave, he was a son of the late James Seaboyer and Amy (Bushen) (Seaboyer) DeMone. Gerald proudly served in the Merchant Navy from December 1939 to April 1942 and the Royal Canadian Navy from May 1942 to June 1945 and took part in the Normandy Invasion. After the war he owned and operated a small fleet of school buses that served Petite Riviere and LaHave schools. He also started a Distribution for British American and later became the bulk distributor for Gulf Oil in Bridgewater. After his retirement, Gerald started Gerald's Buy and Sell which he operated until he reached the young age of 80. Until a year ago, he continued to enjoy refinishing oak office desks and chairs of which he was very proud. Gerald was past Commissioner and member of the LaHave Fire Department and was one of the initial Directors with the formation of the Fort Point Cemetery. Gerald was a wonderful and loving husband and father and will be greatly missed by all who knew him. He is survived by his wife, the former Norma Richards; children, Allan Seaboyer, LaHave; Debbie Seaboyer, Halifax; Kathy Seaboyer, Lunenburg; grandchildren, Mallory Adams, Paige and Anna Giddy; brother, Jim (Marlene) Seaboyer, LaHave. In keeping with Gerald's wishes, there will be no flowers, visitation or funeral service. Memorial donations may be made to the Heart and Stroke Foundation of Nova Scotia or the Crohn's and Colitis Foundation of Canada, 5991 Spring Garden Rd, Halifax, B3H 1Y6. Funeral arrangements entrusted to Sweeny's Funeral Home, Bridgewater. SHAW, Dennis Beaumont - the light of our lives has gone to the great mess deck in the sky. Dennis Beaumont Shaw passed away on March 20, 2016, after 93 wonderful years of life, love and laughter. He was born in 1922 in Worcester, England. A veteran of the Second World War, he served in the Royal Navy in the Mediterranean, Indian, Atlantic, Middle Eastern and Pacific theatres of operation. Soon after the war, he was transferred to the Royal Canadian Navy, where he served until 1971. He then became training manager at Nova Scotia Power Corporation. He was a devout Anglican, a member of Church of Saint Andrew, Cole Harbour and a past Warden of Church of the Holy Spirit, Dartmouth. He also served on the executive of the Friends of the Bishop. He was passionately involved in the Primate’s World Relief and Development Fund, the Anglican Church of Canada’s agency for sustainable development, relief, refugees and global justice. An active Mason, he was a member of Virgin Lodge No. 3 and was master of the Lodge in 1963. He was the District Deputy Grand Master of the first Halifax City District in 1978 and the grand representative to the Grand Lodge of South Australia. Until his death, he was a member of the Atlantic Chapter of the Canadian Naval Air Group and was national president in 1990. He was also on the Shearwater Aviation Museum Foundation Board of Directors for many years. He was a member of Centennial Branch No. 160 of the Royal Canadian Legion. Additionally, he maintained an interest in politics and was a member of the Dartmouth South Progressive Conservative Association. During the 1940s, Dennis was instrumental in the formation of the Shearwater Players and produced, directed and appeared in many naval theatrical productions. During the ’40s, ’50s and ’60s, he was in high demand as a master of ceremonies of local theatre productions and appeared with most leading Nova Scotian performers. He also repeatedly held the position of MC for the Senior Citizen Show sponsored by The Chronicle-Herald and Mail-Star. He was predeceased by his wife, Helen (ne Fox) and is survived by sister, Doreen Pritchard, Worcester, England; a son, Robert (Sheri Ostrynski); and three daughters, Barbara (Paul Kent), Joanne (Steve Nelson), Wendy Calear, Adelaide, Australia. He is also survived by four granddaughters, Denise, Kelly, Julia and Jessica. His most recent joy was his great-grandson, Camden, with a second great-grandchild expected in April. A funeral and celebration of life will be held in Anglican Church of Saint Andrew, 2 Circassion Dr., Cole Harbour at 2 p.m. on Easter Monday, March 28. It was Dennis’ wish that all gifts be made to the church or the Primate’s World Relief & Development Fund. Fair winds and a following sea, Chief. 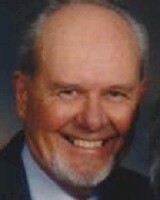 SHEARER, John Roberts (Jack) - Passed away peacefully with family present on Thursday April 21, 2011. Jack was predeceased by his mother Barbara Gray, father Alexander Shearer, step father George Gray, sister Norma Haslam, brother Charlie Shearer and sister in law Delores Shearer. He leaves to mourn the family he loved. His wife Mavis, daughters Cindy Neubauer (Dean), Caron Turk (Dave), sons Cameron (Lisa) and Craig (Cheryl), two step daughters Lori and Kelly Rogers, seven grandchildren Lee, Laine, Kristin, Daniel, Ryan, Shayne and Alex. 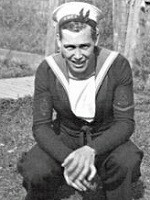 Jack was born September 19, 1922 in Winnipeg, attended Daniel McIntyre Collegiate and then served in the Navy for four years during W.W. 2 with overseas postings on the North Atlantic as a Submarine Detector. On his return to Winnipeg, and his job with M.T.S. he spent 45 years until his retirement as a manager in 1986. Jack was a member of the Masons Capitol Lodge 136 where he received his 50 year medal. He joined the Khartum Shrine in 1973 and became a drummer in his "Pride and Joy", the Drum and Bugle Corps. Jack was also a member of the Legion Branch 215. His enthusiasm and humour never diminished over the years. With many friends at M.T.S. and the Shrine along with his love and affection of family, he regarded these as the "high points" in his life. The family would like to thank the Staff at Kildonan Personal Care Home for the care and affection they provided for him. According to Jack's wishes cremation has taken place and a service in Jack's honour will be held Saturday, April 30, 2011, 2:00 p.m. at Klassen Funeral Home. Flowers gratefully declined. If desired donations may be made to the Khartum Shrine Burn Unit, 1155 Wilkes Ave., Wpg, MB. SMITH, James Carlson - 88, died peacefully on March 20, 2016 at Veterans Place, Yarmouth, NS. Born in Dartmouth, NS on November 8, 1927, Jim grew up in Chester, NS with his parents, Carl Bradford and Mary Winnifred (Carlson) Smith. Jim joined the Royal Canadian Navy in 1947 and served in the Korean War on the HMCS Huron. After retiring from the Armed Forces as a Captain in Winnipeg, he graduated from University of Manitoba with a B.A. and Teaching Certificate. He taught for 9 years at Acadia Junior High in Winnipeg. Jim retired to his beloved Nova Scotia to live in Shelburne. As one of the founding members of the Shelburne Genealogical Society, he served on the board of directors and was editor of the society newsletter. He was a board member of the Shelburne Historical Society, the Federation of Nova Scotia Heritage and the South Shore Tourism Association. He researched and edited the Shelburne County Veterans, Volume III – The Korean War. Jim loved to travel and camped with his family throughout Canada, the US and Europe and travelled to all seven continents with Eleanor. Fly fishing on the Roseway and Clyde River and golfing at River Hills were favourite pastimes. He was an avid reader of poetry and history books. 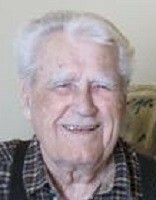 Jim is survived by his beloved wife of 63 years, Eleanor (Robertson) and their three children, Roxanne (Terry) Carter, Gregory (Candy) Smith and Andrea (Terry) Kewin as well as eight grandchildren: Alexandra Carter, Ainsley (Carter) Grabill; Scott and Graham Smith; Jenna (Kewin) Yehia, Marley, Tamara and Breanne Kewin and his great granddaughter Clara . Special thanks to Dr. E. O'Sullivan and nurse Ruth Waters, outstanding caregivers Sheila Williams, Cheri Hallett and Judy Herbert in Shelburne and the wonderful, loving staff and volunteers at Veterans Place. The family would like to also thank Lawrence Bruce and Sandra Bower for all their help and support over the years. In lieu of flowers, donations in Jim's memory may be made to the Trinity United Church, Shelburne, NS, The Shelburne County Genealogical Society or the Tri-County Site of the Victorian Order of Nurses for Shelburne County. A celebration of Jim’s life will be held at Trinity United Church, Shelburne, Rev. Joanne McFadden officiating on Saturday March 26, 2016 at 11:00 a.m. Reception to follow in the Church Hall. 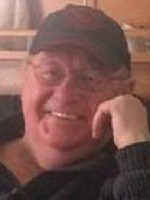 STEWART, James Phillip - age 72, passed away suddenly at home in Upper LaHave on March 14, 2012. He was born on March 31, 1939 in Niagara-on-the-Lake, Ontario, the son of James and Philameon (Smith) Stewart. Jim retired from the Navy as a Master Warrant Officer after 21 years of service. He was retired from Michelin North America after seventeen years of employment. He was a member of the Admiral Desmond Piers Naval Association. Jim was also an avid hunter, baseball player, and golfer and loved to fish. He loved to watch the weather with Cindy Day and had a unique sense of humor and liked to speak his mind. He was married on January 3, 1959 to Barbara (Auld) Stewart. He was a dedicated father, grandfather and great-grandfather. He was a special grandfather to "the kids next door". He is survived by wife Barbara (Auld) children, Jim Stewart (Joeann), Bob Stewart (Deena) Cathy Stewart, Derek Stewart (Michelle), Shannon Stewart (Nathaniel), seventeen grandchildren and 1 great grandchild. He is also survived by his sister Sandra Faranicci and his Aunt Dot Stewart. He was predeceased by his daughter in-law Debbie Stewart. Jim's family always came first and he will be missed. Visitation will be held on Sunday March 18, 2012 from 7:00pm-9:00pm in Sweeny's Funeral Home, Bridgewater and from where a memorial service will be held 11:00 am Monday. Flowers from the immediate family only. Memorial donations may be made to the Wounded Warrior Project. STORDY, Elmer, Cook (1912-1985) - Elmer Stordy was originally from Carleton Siding, PEI. He worked on the PEI car ferries (CN Marine) prior to and after the war. Joining the navy on the Canada's declaration of war, he served from 1939 to 1945 in the Battle of the Atlantic. 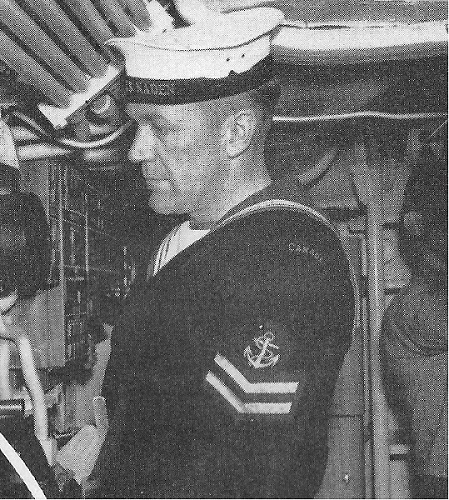 He was a Cook's Assistant on two other Fairmiles, prior to his promotion to Ship's Cook/Third Gunner and his assignment on ML 120. At the end of the war, he received the boat's White Ensign from the commander (for being the eldest member of the ship's NCO crew). He retired from CN Marine in the late 1970's as a linesman for the PEI/NB car ferries. He passed away from pancreatic cancer, October 24, 1985. TAYLOR, Kenneth Lloyd (Kenny) - 68, Lower Barney’s River, passed away peacefully, Sunday, March 20, 2016 at home. Born in Halifax, he was a son of the late Kenneth Earl and Ruby Jean (Dean) Taylor. Kenny was employed with the Canadian Corps of Commissionaires. He served with the Royal Canadian Navy for over 23 years, sailing all over the world, retiring with the rank of Petty Officer, 1st Class. Kenny was a member of the Merigomish and District Volunteer Fire Department. From 1966-1969, he played rhythm guitar in the band, The Weads of Edan. Kenny enjoyed spending time at the camp, hunting and fishing. He was a member of the Pictou County ATV Club and greatly enjoyed four wheeling. Kenny was a kind and generous person, which he extended to the small creatures living near his home. He believed in justice, was passionate about life, loved his family dearly and was considered a “super guy” by all who loved him. Surviving are his wife of 45 years, Cynthia (Marshall); daughters, Tryphena (Mark) Cameron, Westville; Ginger (Bradley) Spurrell, Wembly, Alta. ; son, Shaun (Connie) Taylor, Grande Prairie, Alta. ; sisters, Donna (Ted) Luther, Halifax; Betty (Paul) Geense, Truro; Roberta Archibald (Randy), Middle Musquodoboit; brother, Donald (Cheryl) Taylor, Chaswood; grandchildren, Dylan, Emma, Brittany, Alyssa, Holly and Duncan; brothers-in-law, Ron (Susan) Marshall, Lower Sackville; Wayne (Susan) Marshall, Maitland; many nieces, nephews and cousins. Besides his parents, he was predeceased by sister, Jeanette McKean; brother, Gordon Taylor; mother-in-law, Theresa Marshall; father-in-law, Clyde Marshall. The family will receive visitors 2-4 and 6-8 p.m. Wednesday, March 23rd in P. & K. MacDonald Funeral Home, New Glasgow from where funeral service will be held 11 a.m. Thursday, March 24th in the chapel with Rev. Doug Stewart officiating. Interment will be in Murray’s Point Cemetery, Lower Barney’s River. Family flowers only. Donations may be made in Kenny’s memory to Merigomish and District Volunteer Fire Department. UWINS, Lawrence (Larry) (12 Jul 1935 - 20 Mar 2016) - age 80 ,of Halifax, passed away peacefully on March 20, 2016, in the Geriatrics Ward, Abbie J. Lane Memorial Building, QEII. Larry was born in Quebec City and raised in Montreal by his late parents, Frank and Mildred (Wark). He joined the Royal Canadian Navy in March of 1953 and retired as a PISW in 1986. Larry is survived by his darling wife, Olga (Chaban); daughter, Jennifer (Basil Broders); son, Timothy; granddaughter, Mystique Uwins and grandsons, Luke and Jake Broders; as well as his brothers and sister-inlaw, Walter Chaban, Orest and Carolyn Chaban and their families. He was predeceased by his brother, William and sister, Mildred (Willis). Visitation will be held on Sunday, March 27 from 2-4 and 6-8 p.m. in Cruikshank’s Funeral Home, 2666 Windsor St., Halifax (423-7295) with memorial service taking place on Monday, March 28, also from Cruikshank’s Funeral Home at 1 p.m. with Rev. Bruce Murray officiating. A reception will follow the service. In lieu of flowers, donations may be made to The Lung Association Nova Scotia or The Children’s Wish Foundation of Canada. WALL, John F. - 83, of Pentz, Lunenburg County, passed away April 19, 2003 Fishermen's Memorial Hospital, Veterans Unit, Lunenburg. Born in, Hepburn, Sask., he was a son of the late Jacob P. and Elizabeth (Penner) Wall. He served in the R.C.N. during the Second World War and was employed with the T. Eaton Co. until his retirement. He is survived by his wife, the former Marguerite Pentz; son, John F. Jr., Oakville, Ont. ; daughter, Darlene DeGroot, Brampton, Ont. ; 3 grandchildren; 1 great grandchild; a brother, Albert, Regina, Sask. ; sister, Martha Friesen, Saskatoon, Sask. ; many nieces and nephews. He was predeceased by brothers, William, Archie, Henry, Irvin; sisters, Mary, Friesen, Nora Peters. Cremation has taken place under the direction of Sweeny's Funeral Home, Bridgewater. A memorial service will be held 11am Tuesday in the West Side United Church, Pentz, Rev. George MacLean officiating. Burial will be the Fort Point Cemetery, LaHave. Family flowers only. In lieu of flowers, memorial donations may be made to the West Side United Church, Pentz, or the charity of your choice. There will be no visitation at the funeral home by request. WILEY, Lowell Hugh - Died 25 April 2006 75, Bridgewater, Lunenburg County, passed away peacefully on Tuesday, April 25, 2006 in South Shore Regional Hospital, Bridgewater. Born in St. Stephen, NB, he was a son of the late Milledge and Genevieve (Craig) Wiley. He was retired from the Royal Canadian Navy; a member of the Fairview Masonic Lodge and the Royal Canadian Legion branch 24, Bridgewater. Lowell was a sports enthusiast and was known for his great sense of humor. Surviving are his wife of 55 years, the former Lillian Elizabeth Thompson. Daughter, Shelley Shea (Alan Freeman), Beaverbank; sons, Keith (Faye); Lowell Jr. (Grace), all of Toronto. Grandchildren, Peter, Rowan, Cody, Shawn; great grandchildren, Kirkland, Colby, Shania, Amanda. Brothers, Marvin, Summerside, PE; Douglas, Oak Bay, NB. He was predeceased by daughter, Susan Elizabeth and brother, Sheldon. No visitation at the funeral home by request. Cremation has taken place under the direction of Sweeny's Funeral Home, Bridgewater. A graveside service will be 1:30 p.m. Saturday in Camp Hill Cemetery, Halifax. Rev. Robert Chapman officiating. No flowers by request, donations to charity of choice. A reception will follow at 109 Belleshire Drive, Lower Sackville, all welcome. 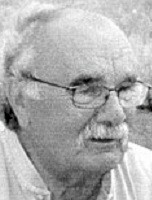 WILLIAMS, Arthur Everett (Art) - age 76, of Windsor Forks, Hants County, passed away on Sunday, November 30, 2014, at his home. Born on August 18, 1938, in Windsor, Nova Scotia, he was the son of the late Fred and Violet (Carson) Williams. Art was a member of the Canadian Armed Forces, serving in the Canadian Navy for over 30 years. In his younger years, he was an active hockey player, having played for the Windsor Maple Leaf's and numerous other teams. Art is survived by his wife, the former Bette Caldwell; daughter, Susan (David) Shaw, Windsor Forks; grandchildren, Ashley (Matthew) Swinamer, Three Mile Plains; Patrick (Angie), Windsor Forks; great grandchildren, Logan and Madison Swinamer; sisters, Eleanor Clayton, Hantsport; Edith "Peg" Williams, Chateauguay, QC; Barbara (Don) Scott, Chateauguay, QC; Carol Draper (Ralph Chancey) Bridgewater; brother, Alfred (Nora), Kingston. He is also survived by several nieces, nephews, cousins and in-laws. Besides his parents, he was predeceased by sisters, Lillie Peach, Mary Lowthers, Maxine Doucet, Elizabeth Church, and Elva Parker; brothers, Lester and Medford "Pete". Cremation has taken place under the care of Lindsay's Windsor Funeral Home, 194 King Street, P.O. Box 2218, Windsor, B0N 2T0. A celebration of his life was held from 2 until 4 pm Thursday, December 4, 2014, at the Royal Canadian Legion Building, 40 Empire Lane, Windsor. Interment will be held at a later date in the Ste. Croix Cemetery. Donations in memory of Art were requested to be made to a charity of choice.